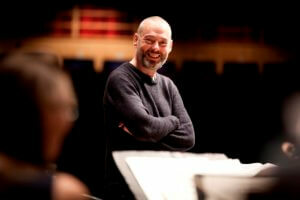 Tenor, Mark Padmore joins Britten Sinfonia in April for Easter performances of Bach’s St John Passion. He took some time out from his busy schedule to answer a few of our questions about himself. Billy Budd – BBC Proms 2013 – the walk off stage. My wife – she is always prepared to go an extra mile. Costume failures are always fun – I still remember a pair of green tights, 2 sizes too small with a ladder up one leg. Erasing all recordings of Bach’s Passions at will. It would be wonderful to only be able to experience it live. Mark Padmore sings the role of Evangelist in Britten Sinfonia’s performances of Bach’s St John Passion on Thursday 13 April at Norwich’s St Andrew’s Hall, Friday 14 April at London’s Barbican and on Saturday 15 April at Cambridge’s King’s College Chapel. Click here to book tickets.